Will there be enough open space at the proposed Atlantic Yards development? Will tall buildings cast debilitating shadows? Will valuable historic buildings be razed? Those questions must be addressed in the pending Draft Environmental Impact Statement (EIS) from the state Empire State Development Corporation (ESDC). 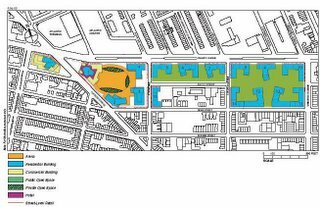 Based on some preliminary discussion yesterday at a meeting of the Brooklyn Borough Board Atlantic Yards Committee, much remains unanswered--but there's reason for concern, especially about open space. It's clear that the proposed seven acres of public open space (plus one acre of private space) doesn't represent the simple bounty promised by developer Forest City Ratner. Yes, the developer has hired Laurie Olin, a noted landscape architect, to try to make the space welcoming--a gesture, like the hiring of architect Frank Gehry to design the project, that represents a step up from past Forest City Ratner project like the Atlantic Center mall or the MetroTech office complex. But the project wouldn't meet either the ambitious state standards for open space or even the more modest city average. State standards call for 2.5 acres of open space for every 1,000 residents--"an ideal set by the state," according to Joshual Laird, Director of Planning for the New York City Department of Parks and Recreation, who said the city average is 1.5 acre per 1,000 residents. (Two of the three Community Boards around the project site don't even reach the city average.) To meet the city average, 7,300 apartments housing 15,000 people (a conservative estimate) would require 22.5 acres of open space, and if they housed 18,000 people, that would require 27 acres of open space. "Many communities are below the [2.5-acre] ratio," observed Micaela Birmingham, Planning Director of New Yorkers for Parks. "We could maybe revisit this ratio and consider that it should be higher." What if the commentators on the EIS can't influence the developer and the state to change the current proposal? "The burden is not to bring them up to 1.5 or 2.5 acres [per 1,000 people]," Laird said. Still, he said, "If this ultimately reveals that the number of people will lower that ratio, something has to happen." Jerry Armer, Chair of Community Board 6, did some preliminary math, observing, "My concern is that the addition of residents will take that ratio and make it more negative." The roof of the arena, once billed as a home for a running track and ice rink, now would be available only to the residents of the surrounding towers, a change that Borough President Marty Markowitz has criticized. Panelists spoke cautiously about it. Laird said, "Rooftop [space] can work, but it has to be programmed." Birmingham backed that up, stressing, "If rooftop open spaces are not very carefully programmed, they can be very desolate spots." She added that she hoped "it would be analyzed with the hope at some point it could be made public." Armer asked if there were other good examples of rooftop use. Laird cited the heavily-used Riverbank State Park at 145th Street in Manhattan, but Armer noted that "that has a direct connection to the community. It's not like you have to take an elevator or an escalator." Asked how more open space might be created in the area, Birmingham suggested that the Atlantic Center mall "has a lot of roofs, and could be made more green." She said the entrance to the mall, where Pathmark is located, could be redesigned. Laird said his agency had been looking at schoolyards, which could be expanded to serve as open space. Laird was asked whether the city calculated the loss of city streets in its assessment of open space. "We haven't assessed it," he said. "We wouldn't typically look at demapped streets as lost." What about sidewalks? "We do not typically calculate the area of sidewalks," he said, noting that doing so would increase the amount of open space for all communities. True, streets do not equal open space, but the taking of streets is an integral part of the project. Later, Laird was observed in discussion with architect and blogger Jonathan Cohn, who has argued that Forest City Ratner can afford to provide the open space it plans only by using city streets, writing: So almost half of what the project is 'providing' in open space is space that was already supposed to be open in perpetuity, according to the city plan. Is there a good example of privately-owned public space, panelists were asked, that board members could consider? Birmingham pointed to a study published by the city and the Municipal Art Society and noted that the use of elements like spikes or bollards can deter people. "Many times the public doesn't know they're allowed to enter," she said. "When you have large towers [as at Atlantic Yards]... the orientation might lead people to believe that [the open space] are the backyards of residents." "You're right to be concerned," said Winston Von Engel, of the Department of City Planning Brooklyn Office, who noted that the city now requires plaques at such open space that spell out open hours and other amenities. "Joshua [Laird] reminds me that [Forest City Ratner's] MetroTech is also privately-owned public space." Birmingham commented, "Maybe that's not a good example." She was part of the group that accompanied Danish urban planner Jan Gehl during his critical walk through MetroTech and nearby areas in November. Von Engel, while acknowledging he's not an expert on shadows, observed that building shadows can "have a very negative effect" and that "a shadow analysis is absolutely critical." When the analysis is done, said Laird of the Parks Department, "We'll look at the impacts to our facilities." 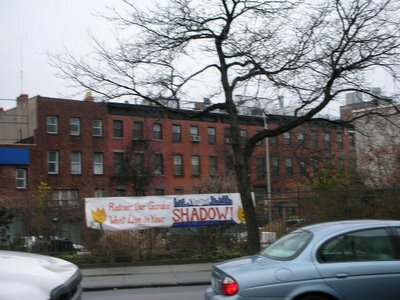 Would the state analysis include the impact of shadows in denying access by those at nearby buildings to solar energy? "That's not one of the categories I'm aware of," Von Engel said. Birmingham picked that up: "These are innovative ideas that should be acknowledged by SEQRA." SEQRA is the State Environmental Quality Act, which governs the process. Kersavage noted that the buildings had been identified by community groups, but the Municipal Art Society has not yet taken a stand on them. 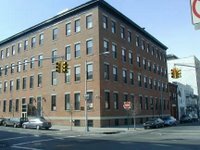 "The real way to save the buildings is to have them identified by [the city] Landmarks [Commission], outside the EIS," she said. Still, she said, her organization would look at whether the buildings could be incorporated into the project. 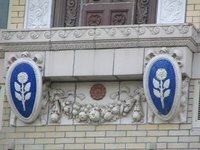 Kathleen Howe, a Historic Preservation Specialist for the state, called the Ward Bakery "a very interesting building with wonderful terra cotta." 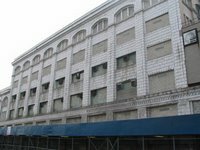 She noted that a landmark designation could provide a 20% federal tax credit to help a property owner preserve and renovate it. The building, later owned by the Pechter-Field (also known as Pechter) Baking company, closed in 1995 after losing a $12 million contract with the city's Board of Education. An 8/20/95 New York Times article (400 Jobless as Bakery Closes) cited "diminishing prices for baked goods, high labor costs and greater competition." The article appeared under the rubric "Neighborhood Report: Bedford-Stuyvesant." A 12/27/80 New York Times article ($750,000 TAKEN IN TRUCK ROBBERY) about a robbery of an armored truck outside the bakery described the location as Crown Heights. Forest City Ratner last year agreed to pay owner Leviev Boymelgreen $44 million for the bakery and another property at 546 Vanderbilt Avenue, the Brooklyn Papers reported in a 4/9/05 article headlined $24M arena jackpot. Developer Shaya Boymelgreen, who had paid $20 million for buildings, had announced plans to build a hotel. The contract indicates that the transaction must be consummated by March 31, 2006--which suggests that there may be a renewable option to buy. What about the Atlantic Art building? "It's got terra cotta," Howe said, but the question is the building's integrity. "That building has been converted to residential, which is great, but changes to the interior and windows" have altered it. "So our call was it did not meet our criteria." "Isn't it possible for historic buildings to be documented" rather than preserved, asked Greg Atkins, Markowitz's chief of staff. Responded Ruth Pierpoint of the New York State Historic Preservation Office, "I think that's probably the last alternative."